Polyalkylene glycols (PAGs) are used in a wide variety of end-use markets; this report concentrates on nonurethane applications, which include markets for lubricants (including functional fluids), personal care products and pharmaceuticals, concrete admixtures, surfactants, and chemical intermediates. The markets for polyalkylene glycols generally depend on the performance of the general economy, especially in the developed regions and rapidly developing regions of the world. In China, much higher growth is expected. The major use is methoxy-PEG (MPEG) consumption in the production of polycarboxylate ethers (PCE, polyacrylic acids with MPEG side chains) and their use as concrete additives. This market is forecast to grow at an average annual rate of 9% during 2016–21. In the United States and Western Europe, PEG derivative use in PCE will grow by about 3% during the forecast period. In some other Asian countries, such as India and South Korea, PAG consumption is expected to grow at a relatively high rate through 2021. 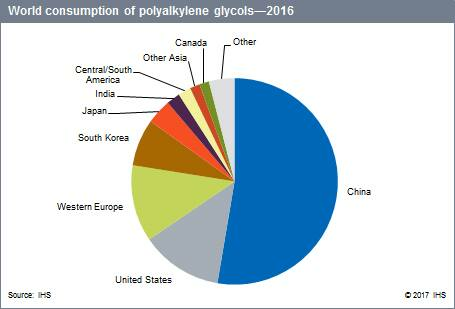 In China, polyethylene glycols (PEGs) have been the largest-volume and fastest-growing PAG product in recent years. In 2016, PEGs represented 93% of total PAG consumption in China. Polypropylene glycols (PPGs) and EO/PO block and random copolymers accounted for the remainder. Production of polycarboxylate ethers (PCEs) used as concrete additives was the largest outlet in China, accounting for nearly 86% of the total PAG consumption in 2016. Overall Chinese PAG consumption is expected to increase at an average annual rate of 8.5% for the next five years, driven by the expected 9% average annual growth for PCE. In the United States, PEGs accounted for 36% of total PAG consumption in 2016, while EO/PO block and random copolymers accounted for 28% and 24%, respectively. Of the total PAG consumption, lubricants (including functional fluids) were the largest market, followed by PCE production for concrete additives and personal care products and pharmaceuticals. Most of the remaining PAG consumption was for surfactants used in various industries. PAG consumption in the United States is expected to increase at an average rate of about 2.5% per year for the next five years. In Western Europe, PEGs represented 64% of total PAG consumption, followed by EO/PO block and random copolymers and PPGs. PCE for concrete consumed the majority of PAG in 2016, followed by lubricants (including functional fluids) and personal care products and pharmaceuticals. PAG consumption in Western Europe is expected to increase at an annual rate of almost 2.0% for the next five years. Nearly 50 companies produce polyalkylene glycols in the United States, Western Europe, and Japan. About 40 companies produce PAGs in China; another 40–50 companies produce PAGs in the rest of the world. The largest producer in China, Liaonin Oxiranchem, and some other Chinese producers are focusing on polyethylene glycols including MPEG consumed for concrete admixtures, driven by the rising demand in construction and infrastructure industries. Average annual growth for global PAG consumption is forecast to be about 6% through 2021, driven primarily by consumption for concrete admixtures in China and Other Asian countries. Much higher overall growth is expected in China and some Other Asian countries, such as India and South Korea, where PAG consumption is expected to increase at rates of 7–9% per year through 2021.